An increase in our remanufactured parts business not only enhances our product stewardship, but also supports farmers with better parts availability. Detailed action plans to continue to manage the social risks in our purchasing actions. Continued improvement of our safety performance through a new “Focus” program. AGCO’s sustainability objectives were developed to provide the biggest impact as we prioritize the pressing global economic, environmental and social issues facing AGCO’s stakeholders. 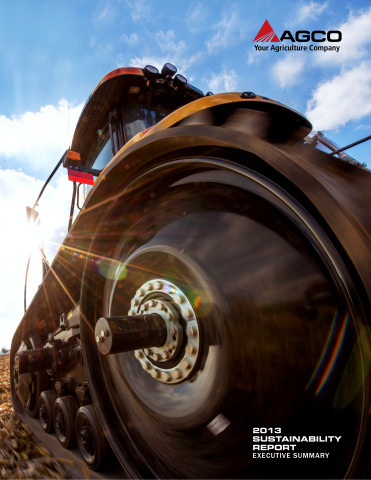 Aligning with the Global Reporting Initiative™ (GRI) 3.1 reporting guidelines, the report gives a transparent update on performance to date in relation to AGCO’s sustainability goals. AGCO’s 2013 Sustainability Report is available at http://bit.ly/AGCOsustainability2013. The 2013 Sustainability Report is an executive summary that provides an overview of AGCO’s progress highlights in environmental and social challenges material to the company and its stakeholders.